No Right Turn writes on the Oxfam report about the deliberate concentration of wealth by subverting the political process towards the inequality levels displayed in the movie Elysium. The extent to which so much global wealth has become corralled by a virtual handful of the so-called ‘global elite’ is exposed in a new report from Oxfam on Monday. It warned that those richest 85 people across the globe share a combined wealth of £1tn, as much as the poorest 3.5 billion of the world’s population. The wealth of the 1% richest people in the world amounts to $110tn (£60.88tn), or 65 times as much as the poorest half of the world, added the development charity, which fears this concentration of economic resources is threatening political stability and driving up social tensions. The Oxfam report found that over the past few decades, the rich have successfully wielded political influence to skew policies in their favour on issues ranging from financial deregulation, tax havens, anti-competitive business practices to lower tax rates on high incomes and cuts in public services for the majority. Since the late 1970s, tax rates for the richest have fallen in 29 out of 30 countries for which data are available, said the report. To point out the obvious, this is highly undemocratic. And if we want to solve the problem of inequality, we need to start by taking back our democracy and removing the influence of wealth from our political system. We’ve outlawed direct bribes, but that hasn’t been enough; we now need to outlaw large donations and replace them with public funding instead. No-one likes politicians, but if we want them to listen to us rather than the rich, then we need to be the ones paying them. Its that simple. Surely we’re due for an 1848 year soon. Long the Paris streets, the death-carts rumble, hollow and harsh. Six tumbrils carry the day’s wine to La Guillotine. All the devouring and insatiate Monsters imagined since imagination could record itself, are fused in the one realisation, Guillotine. And yet there is not in France, with its rich variety of soil and climate, a blade, a leaf, a root, a sprig, a peppercorn, which will grow to maturity under conditions more certain than those that have produced this horror. Crush humanity out of shape once more, under similar hammers, and it will twist itself into the same tortured forms. Sow the same seed of rapacious license and oppression over again, and it will surely yield the same fruit according to its kind. Coincidentally, the Bill & Melinda Gates Foundation 2014 letter – 3 Myths that Block Progress for the Poor. This has got to be a sick joke. 47M Americans on foodstamps with 1 in 4 American children relying on foodstamps just to eat during each month. Tens of thousands of US prisoners working for corporations at pay rates ranging from $1/hr to nothing i.e. slave labour. While ordinary American jobs get outsourced to either Asia, or to these prison labour camps. And of course the inmates are almost all black or brown. What colour are the people on the Boards of corporates who use this prison labour? White, of course. Did you happen to notice how ‘getting richer’ also improved the weather and the quality of daylight over the cities compared in those ‘before and after’ photos? Do you feel that itch? That’s what it feels like to be propagandised. I tried to read through that link – I really did. Too much rising anger. Stopped. sigh Really despise those vile ‘do-gooder, conscience salving, shoulder shrugging – ‘What did I do ‘bad” types like Gates. Entry through St Peter’s gates seems to be getting more expensive for some types nowadays. Hi. It occurs to me that this article refers to the world not just America. Why is it that so many of you in America can only see your own country as something existing! This is a world wide problem and would be helped by it being seen as more than an American problem. I agree with your sentiments, but as an outsider of the US of A, I would love the word to spread that we too matter! Yeah, most of their money exists as a giant hedge fund and they’re wrong about camels too. Those 3 billion are just lazy. Am reading schama’s “citizens” . As we speak. The crash if the 80s and the gfc were not socialist failures. I think that this article’s message can’t be repeated too often. I fail to imagine the many serious issues we face currently being addressed* before this one of inequality is – because inequality is adversely affecting democracy. I would attack both the issues at the same time – the compromised democracy and the inequality. All these issues and more are not being addressed because it goes directly against the interests of the wealthiest in this world to have that occur. Watched “Elysium” a night ago and it really is that bad right now, not some nasty futurist projection. The filthy rich are not off planet just yet but they do their best to isolate themselves from what they are responsible for in their highly secure enclaves. The dirty bludgers could be gone by lunchtime if not for the politically disengaged aspirational and alienated amongst us, aka the majority. Hope I don’t wind up boring people with this, (I probably will) but the inequality (or whatever else) isn’t a ‘threat to democracy’. As the post points out, the situation of our governance is that it’s ‘highly undemocratic’. Before that, it was simply less undemocratic. But whatever, it certainly wasn’t democratic. Anyway, fighting to get back to a situation where our governance was less undemocratic simply can’t be said to be ‘taking back our democracy’. If we want democracy, then we have to begin to demand it, practice it and develop it – not hold to an ideal or pursue a goal based on a past that, at a fundamental level, wasn’t. Bill, you appear to be getting caught up in semantics here. “For corporations and Wall Street, campaign finance is only one weapon. The other is direct spending to influence policy. Indeed, for most organized interests, spending on elections is just the training season; the real games begin once elected officials start governing…. …. Koch Industries, which is involved in industries ranging from manufacturing to energy production, benefits enormously from subsidies for big energy, as well as from the malign neglect of climate change—a status quo the Kochs have worked aggressively to preserve. And for most corporate lobbies, there’s not even a screen of ideology. Their overriding goal is to protect or expand their market advantage. The financial industry lobbied to wipe out the New Deal-era rules that reduced systemic risks—but also industry profits. The pharmaceutical and hospital lobbies have repeatedly killed off threats to high medical prices, padding their pockets and driving up public and private spending. The oil and gas industries use their heft in Washington not only to oppose climate change policies, but to protect valuable land leases through which they are able to exploit public resources for pennies on the dollar. It’s not semantics when the word or term being bandied about is referring to a reality that has nothing to do with what the word means. Think of the USSR and communists pushing for communism where ‘the Party’ had appropriated the term and used it to define something that in reality was a million miles away from communism. It’s the same for us with the term democracy. On the rest of your comment. Of course ‘big money’ skews the priorities and focus of governing structures/institutions. And of course its influence should be stamped out or pushed into touch. That is what this thread was about. Your comment takes the focus off a very important point that needs to be made. As for the semantics – are you referring to representative democracy? 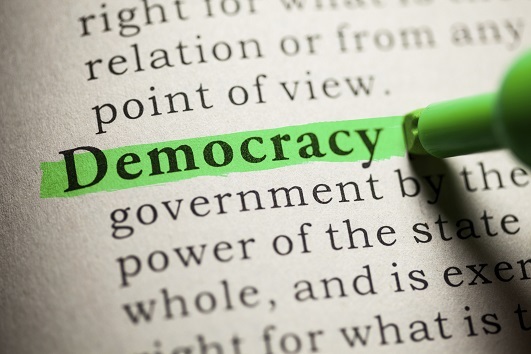 Both the strength and the weakness of the English language is that words tend to change meaning – when someone refers to democracy – most of the time (if not all) they are speaking of representative democracy – also it refers to the ability for citizens of a country to become actively involved in a democratic process with a chance of influencing the outcome – both these factors of ‘democracy’ are being severely lessened by the presence of some persons (legal persons included – i.e corporations) having way more clout than an ordinary individual or group of ordinary individuals. Re the English language, though – it is a good idea to be specific with the language – so if that is the point you are making – I take that on board and agree. What is the origin of the word revolution? ANyone read ben eltons stark and gridlock? Read Stark over twenty years ago…. would that be right? I thought it was just a plotline, should’ve looked into it more. Just recently been thinking of buying a copy for my teenaged son. Yup, it would be. Funny but underlying a social principle. He sends up Packer and Murdoch… and through his humour highlights the poor/rich divide and the rich habit of shitting in their own backyard while financing to move planet when this one is fucked. gridlock looks at oil control and so forth in the same vein. Read Stark about 10 years or so ago and even while reading it was thinking we’re seeing this now. Same as when I read the Handmaid’s Tale. Our problem is that we live under a kind of sophisticated feudal system. We just dont know who our over lords are because they lurk in the shadows anonymously donating to those in elected power. And it’s damn difficult to trace who actually owns what in this globalised world of PO Box companies and tax havens. NRT on Chinese elite using tax havens – from data dump by International Consortium of Investigative Journalists – it’s a global disease – the few siphoning off the world’s wealth for their own greed. If we can set aside the morality of inequality for just one moment, if wealth was distributed more evenly around the globe would it then be expectant that the consumption rate of resources would increase? If hundreds of millions, even billions, more were in a position to afford a higher protein diet and use fossil fuels, metals, etc. then wouldn’t problems of depletion and climate change occur at a greatly accelerated rate? China is a case in point – GDP per cap went from $153 in 1978 to $9,828 in 2012. There are now 400m middle class consumers, with that forecast to increase 60% by 2022. This surge in wealth has caused China’s CO2 emissions to increase 40% in the last four years. Not suggesting that reducing inequality should be forgone but the results of widespread redistribution could be impossible to manage. surely to handle that the answer is not to just redistribute moeny but to alter entirely how our monetary system and society operates? I am beginning to think the Luddites are right. where previous mutiny has been an objection tot he speed of change through industrialisation etc, maybe the next is the speed of change due to technology and the loss of personal autonomy as a result? Did you read the article posted very recently about what happened when more money was given to the homeless and the poor? It’s worth a read. if wealth was distributed more evenly around the globe would it then be expectant that the consumption rate of resources would increase? No, I think the opposite is true – due to those with the most capital having the most political clout – extreme inefficiency is resulting – because such increases profits for them. For example, energy: why have we persisted for so long with petrol when there are other forms of energy that have been discovered and could have been developed when we have known there is a problem with oil running out? Why were our railway tracks ripped up and public transport systems not used more? Why do our household items and clothes fall to bits so quickly when they used to last for ages? And if we want to solve the problem of inequality, we need to start by taking back our democracy and removing the influence of wealth from our political system. And then we need to start taking our wealth. This appears to be a consensus view of economists and insiders in the lead-up to the meeting which will be attended by more than 2,500 political, business, and academic leaders. Finance Minister Bill English will be attending from New Zealand. The World Economic Forum is well named, not because it’s a democratically selected group, but because the invited guests are those who run the global economy on behalf of the world’s richest people – the 1%.